Creators: Stan Lee and John Romita Sr. Enhanced Abilities: The Rhino’s Strength, Endurance and Durability have all been enhanced by chemical and radiation treatments. Body Armour: The Rhino’s suit provides him with a high degree of protection from physical and energy attacks. Charging: The Rhino’s head piece has a horn. By lowering his head and charging he can cause serious damage. Aleksei Sytsevich was just another thug in the Russian Mafia, grasping at dreams of easy money, and headed for a short brutal life. Seduced by promises of wealth and power, Aleksei underwent a life-threatening series of chemical and radiation treatments to transform him after several months into the superhumanly strong agent for a collective of professional spies - in part, to support his family. Aleksei's powerful armour, permanently bonded to his form, was modelled after the hide of a rhinoceros. Two scientists named Igor and Georgi chose this form, both for its visual impact and in recognition of the fact that the rhino is the result of countless generations of evolution towards the ultimate form for armoured assault. They selected Aleksei for his muscular physique and low intelligence, which they believed would insure his loyalty. 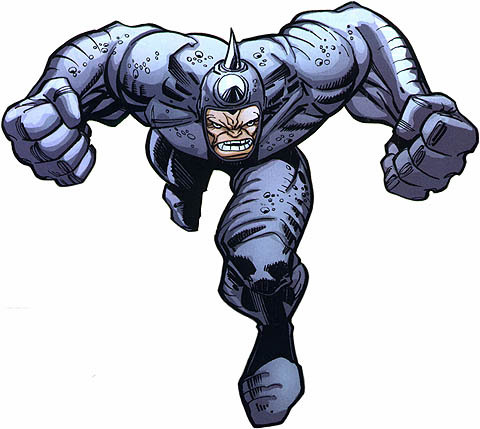 He was given the code name Rhino.